New song pluggers group Pitch, Please! 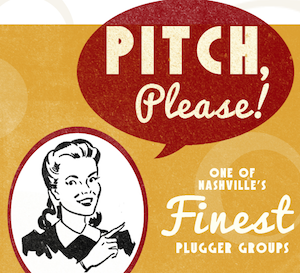 will hold its first writers night at Nashville’s SoulShine Pizza Factory on Wednesday (June 19), from 6 p.m.—9 p.m. Song pluggers include Shea Fowler (Cornman), Laura Wright (Big Yellow Dog), Blain Rhodes (Warner Chappell), Tali Giles (Big Machine) and Lee Krabel (HoriPro). SoulShine Pizza Factory is located at 1907 Division Street.